Jake Williams killed this big buck on Christmas day 2018. 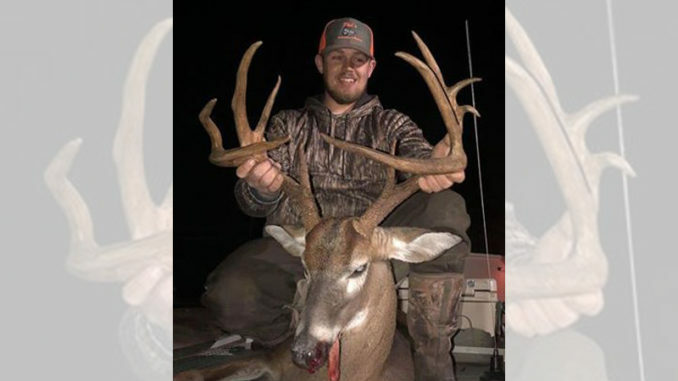 When Jake Williams of Hamlet, N.C. heard about a huge buck being spotted near his Richmond County hunting stand this past November, he put up a trail camera and checked it often. He finally killed the deer on Christmas afternoon. The mainframe 8-point buck weighed 170 pounds, had 11 scoreable points, and was green-scored at 154 inches. Williams shot it with his Browning 7 Mag Safari from about 80 yards away. But he was beginning to think he’d never get a shot at the deer. “When I first checked the camera, I noticed the deer showed up every day at first. But just as quick, it started coming only at night. One day it showed up on camera at 1:15 p.m., but always in the dark otherwise. But then a few days before Christmas, it showed up during daylight in the morning and evening,” said Williams. It did the same thing the next morning. With work and holiday functions keeping him busy, Williams was anxious about not being in the woods. Especially since the buck had begun making daytime visits. “I’d never hunted on Christmas day before, so I was glad to get the chance this year. I got in the stand around 4 p.m. and saw three does pretty quick. One ran off and I thought I’d been busted. But the other two stayed. They kept looking around kind of nervous, and in a little while, the buck walked out with his head down,” he said. Through thick brush, Williams could see antlers — big antlers — but he wasn’t sure if it was the same deer, or another sizable buck he’d also gotten some photos of. Either way, he knew it was a shooter, so he got himself ready. “He kept his head down the whole time, and when he finally quartered toward me, I had a clean shot and I took it. I hit him high in the shoulder and he dropped where he stood,” he said. With the buck on the ground and not moving, Williams didn’t waste any time getting out of the box stand. Once he got to the deer, he realized it was the trophy he’d been after for over a month. “Once I got to it, that’s when I finally knew it was him. Man, that was a good feeling. It’s my biggest buck ever. Earlier in the season, I killed one that was my biggest ever at the time, but he isn’t near what this one is. 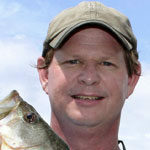 Killing this one was a great Christmas present,” he said. Aaron Hill of Hill’s Taxidermy in Wadesboro is creating a mount to help Williams commemorate the hunt. Williams hopes to bring the mount to the Dixie Deer Classic in Raleigh this coming March to have the buck officially scored.